Need your West University Place facility pressure cleaned? Complete Custodial Care, Inc provides efficient, powerful pressure washing for commercial businesses in West University Place, Texas. Our outdoor pressure washing equipment effectively gets rid of slime, grime, dirt, moss and other debris. Make the outside of your building look its best by scheduling a Complete Custodial Care, Inc pressure cleaning for your West University Place business. We've been in the power cleaning business since 1997. Call (281) 747-9344 today for a free commercial pressure washing quote. Power wash your West University Place property. 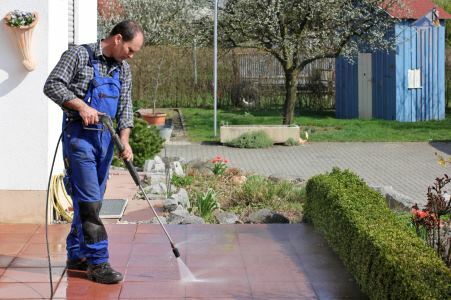 We've got the equipment to professionally power wash large outdoor seating and dining areas, as well as exterior walls, for your West University Place, TX business. Complete Custodial Care, Inc offers flexible commercial cleaning contracts for West University Place pressure washing services, including: regularly scheduled cleaning, seasonal cleaning, and one-time cleaning before/after a special event. Call (281) 747-9344 to speak with an experienced West University Place pressure washing professional.